Nurses are a constant presence at the bedside and regularly interact with physicians, pharmacists, families, and all other members of the health care team but, physicians may spend only 30 to 45 minutes a day with even a critically ill hospitalized patient. This means Nurses have the critical role in ensuring a patient's safety. According to Agency for Healthcare Research and Quality, assigning increasing numbers of patients eventually compromises a Nurses' ability to provide safe care. Several seminal studies have demonstrated the link between Nurse staffing ratios and patient safety, documenting an increased risk of patient safety events, morbidity, and even mortality as the number of patients per Nurse increases. The strength of these data has led several states, beginning with California in 2004, to establish legislatively mandated minimum Nurse-to-patient ratios; in California, acute medical–surgical inpatient units may assign no more than five patients to each registered Nurse. 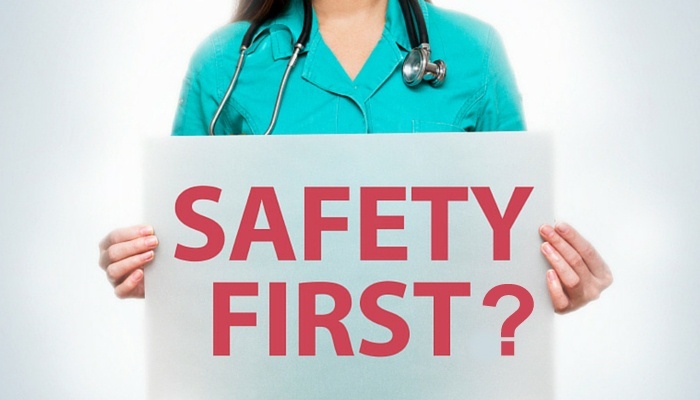 • Speaking with your Nurse manager and CNO when policies and procedures governing safety are not being followed. It is common for hospitals and clinics to request that their Nursing staff work overtime. While working overtime can be an effective solution to a Nursing shortage, it also can present a number of problems. Nurses risk becoming burned out, tired and/or stressed if they take on too much overtime. A study conducted by the Pennsylvania Patient Safety Reporting System showed working a 12-hour shift or working overtime was related to having trouble staying awake during the shift, reduced sleep times and nearly three times the risk of making an error. The most common medication errors identified in the study due to Nurse fatigue were wrong doses, dose omission and extra doses. Health care teams that communicate effectively and work togehter reduce the potential for error, resulting in an improved clinical performance. According to the American Hospital Association, A key aspect in improving teamwork and communication in health care is engaging patients and families. Increasingly, research shows a correlation between increased patient and family engagement and fewer adverse events. Determining how patients and families want to be involved in their care and then engaging them in designing their plan of care increases their understanding of tests, procedures, and anticipated care outcomes, including a successful discharge. If you have any questions about patient or staff safety, please click below to ask your question and a Nurse Leader will respond.